Miyu es una niña preciosa, muchas felicidades. También me he alegrado mucho al saber que Bo-chan está bien. This is late however congratulations. She is beautiful. OMG she is soooooo gorgeous! Your baby is lovely, cute and smart! Add me to the smitten list. Miyu is absolutely adorable! beautiful little girl... and have a lot of hair!!! oh, mai, she's adorable! thanks for sharing those hi-lights. take care. she's really so adorable. and more adorable again that she can use her chamber pot this early.. wow..
Miyu is so beautiful! Such a beautiful smile. I am facinated with the use of the chamber pot with a child so little. Does this mean you do not use diapers at all? Do you take the chamber pot with you when you go out? What a wonderful way of ridding the world of dirty diapers! Wow! potty training and she´s so little! that´s so smart, i want to do it! My Lord Mai, how does Miyu get so absolutely more gorgeous every time we see her?. 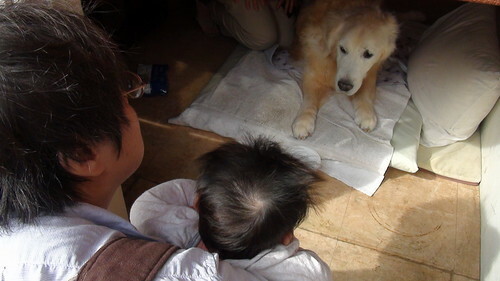 I am so glad she got to meet Bo-chan. Clever girl using the chamber pot. I love the smile that she is giving you. Pure sweet love. But the pots available here in the US are not so cute as the one you use! There are just not enough of us doing this, so there are no manufacturers making the pots and we have to have them shipped. o my god...Miyu is so pretty...congratulation !! Miyu is so beautiful! Thank you for your blog it's very interesting. I love to read it again and again. Oh my God, she is soooo cute! Gratulacje!!! Miyu is soo adorable!! I just love her so much. :) Have a lovely merry happy holiday season and love to you! YOUR BLOG IS VERY BEAUTIFUL. KISS. omg..i wish they had them here in the U.S...smart little girl! What a smart cookie using the chamber pot already! She is absolutely gorgeous, congratulations! She is such a precious and beautiful little girl! And she's so lucky to have such loving parents. Congratulations! I found your lovely blog because of your square gift bags. I love what I see here. Your baby is adorable. It warms my heart that Miyu got to meet Bo-Chan, too sweet! Thanks for sharing!